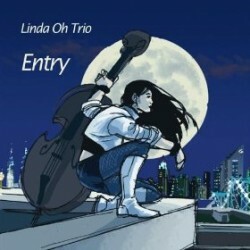 Bassist Linda Oh was born in Malaysia to Chinese parents, grew up in Perth, Australia, and now plays the bass in New York City. Her debut recording, Entry (self-produced, 2009), is a strong trio statement featuring trumpeter Ambrose Akinmusire and drummer Obed Calvaire. In this interview, Oh discusses her decision to challenge herself on her first recording; her upbringing and how it influenced her decision to become a jazz bassist; and how she has dealt with stereotypes about Asian women as she’s forged her career. Learn more at www.lindaohmusic.com. It was funny how she was referring to her band-mates as ‘young men’ … and then talking about being in university for music in 2002!